Why are Residential & Commercial BER Certs Required? S.I. 243 of 2012 European Union (Energy Performance of Buildings) Regulations, 2012 makes provisions for the inclusion of BER information in property sale and rental advertisements. The regulations also mandate that the Sustainable Energy Authority of Ireland (SEAI) as the designated Issuing Authority shall publish guidelines as to how Building Energy Rating (BER) details would be conveyed such advertisements. A summary of the provisions are: - A person offering a property for sale or rent on or after 9th January 2013, or their agent, shall ensure that the energy performance indicator of the current BER certificate for the building is stated in any advertisements, where such advertisements are taken relating to the sale or letting of that building. - Prospective buyers and renters will be shown the BER rating (Alphanumeric value) along with other prescribed content (dependent on the particular medium) in a prominent location in each specific advertisement - Where images of the property are used then the presentation of the alphanumeric value will be by way of the prescribed BER Alphanumeric Rating Motif for the particular property rating - These requirements apply to advertisements, meaning a public announcement in: newspaper, magazine, brochure, leaflet, advertising notice, vehicle, radio, television, internet (including apps and social media) and direct mail. Why is an Energy Rating Advisory Report Required? A Commercial or Residential BER cert must be accompanied by an "Advisory Report" setting out recommendations for cost-effective improvements to the energy performance of the building. However there is no legal obligation on vendors or prospective purchasers to carry out the recommended improvements. At what point is a BER cert required? A person who commissions the construction of a building shall, before such building is occupied for the first time, secure a BER certificate and advisory report. A person who offers for sale or letting (whether in writing or otherwise) - a building that is in existence on or before 1 January 2009 and any agent acting on behalf of such person in connection with such offering, shall produce a printed copy of the BER certificate and advisory report in relation to the building to any person expressing an interest in purchasing or taking a letting of the building and on demand to the building control authority in whose functional area the building is situated. What exactly is on a BER Cert and what does it mean? The BER cert. looks broadly similar to the energy labels now provided with vehicles and many household appliances. 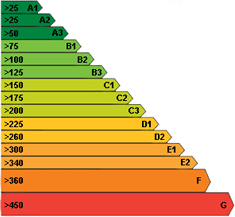 Its purpose is to indicate how energy efficient a building is. The BER certificate will provide an energy rating of the building from A to G, where A is very efficient and G is the least efficient. The better the rating, the more energy-efficient the building is, and the lower the fuel bills are likely to be. The energy performance of the building is accompanied by a CO2 emissions indicator. Who can carry out BER Assessments? Assessments can only be carried out by SEI registered BER assessors who must act in an independent manner. This independence means that they or connected persons can have no interest in the outcome of the BER energy rating other than the fee that they receive for the work. This means in practice that estate agents cannot directly employ energy assessors who will certify buildings that the agent is involved in letting or selling and further the code of conduct from SEI also prohibits an estate agent from engaging a connected (business partner or close family relation) company to carry out the Commercial or Residential BER assessment. Another example of the obligation to act in an independent manner is that a BER assessor employed by a company with a connection to a building owner is prohibited from carrying out an assessment on that building. Hence estate agents must use independent companies to carry out BER assessments, Commercial Energy Ratings Ltd. is one such company. What is involved in producing a Domestic BER Cert? Through a non-invasive survey, the assessor will need to ascertain the year of construction, area and layout of the building, method of construction, fenestration details, space and water heating systems and loft insulation. As a result, the assessor will need access to all areas of the property. The information gathered from the survey is then inputted into specialised software which calculates the Building Energy Rating. What is involved in producing a Commercial BER Cert? improve rating and clarify payback on recommendations. Both the Commercial BER cert. and the advisory report are lodged for approval by SEAI prior to publication on the national register and can only be issued to clients once approved. Any extension of the building; Any internal layout changes even if only partitions or Any change in the heating (or lighting system) for the building or in the type of fuel used by that system. How much does a Domestic BER Cert cost? Charges vary depending on building size and whether it is being rated from plans or for an existing building. The cost of lodging a domestic BER cert with SEI is currently €22.50 Please contact us for a quotation for your building. How much does a Commercial BER Cert cost? The cost of surveying & producing a Commercial BER cert varies according to a number of factors including, size, age of building, quantity of fenestration, extent to which building is divided into activity areas e.g. cellular offices versus open plan, canteens, store rooms etc. and most importantly availability of accurate documentation specifically floor plans. Commercial Energy Ratings offer Commercial BER certs from as low as €200 excluding CERT & VAT. The cost of lodging a non domestic BER cert with SEAI is currently €45 (No VAT).